Driving into a European city always makes my heart race a little. When you’re used to Manhattan’s West-Side Highway and FDR Drive and the numerical grid system that gets you most places you want to go, the diagonal avenues and alley-way like streets of every European city of note, from Paris to Barcelona, are not only foreign, they’re frightening. And there’s nothing worse than braving the traffic of a European city only to find the streets you need are closed off with major police activity. 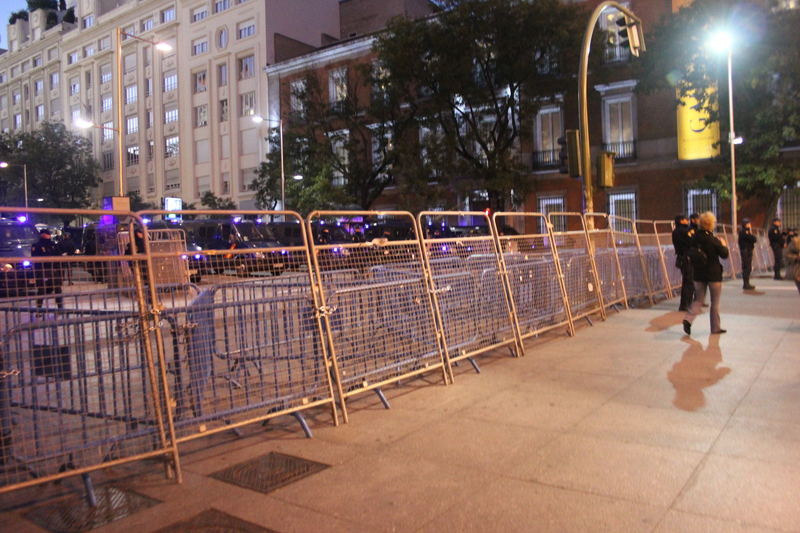 the street to our hotel was completely barricaded, because not only did it lead to the Westin, it lead to the Ministry of the Interior. 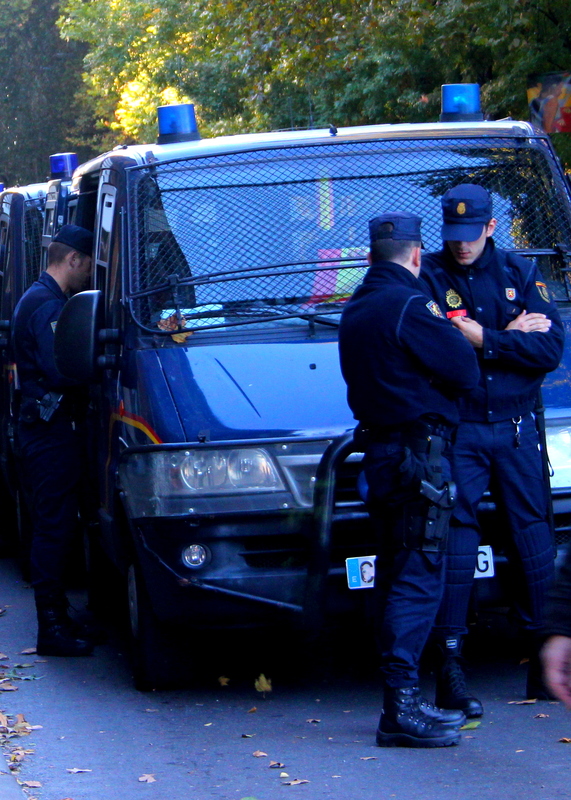 Turning off the Paseo del Prado, Madrid’s main drag, onto Calle Mayor, the car came to a complete halt. We had noticed the long line of Mercedes Policzia vans lined up along the Paseo del Prado, but we weren’t expecting to hit a barricade. The last time we were in Madrid it was also October and military planes were flying overhead — they were rehearsing for military day. We assumed this might be something similar. Indeed, they were preparing to show off their military might, but not for a celebration. 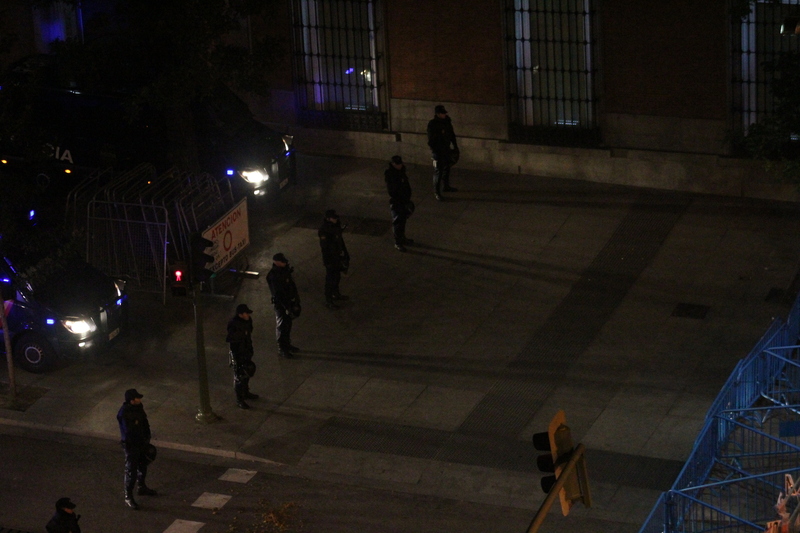 An “Occupy” protest was planned for the evening and the hundreds of police milling about were readying the Plaza de las Cortes for thousands of dissatisfied Spaniards. We were granted access to Calle Mayor and our hotel, but were warned that later we might not be so lucky. Our hotel was located across the street from the Ministry of the Interior, which explained why the protestors had chosen the location. And explained the extra heavy police presence outside the doors. Let me pause here and say that the Madrid police are very impressive. 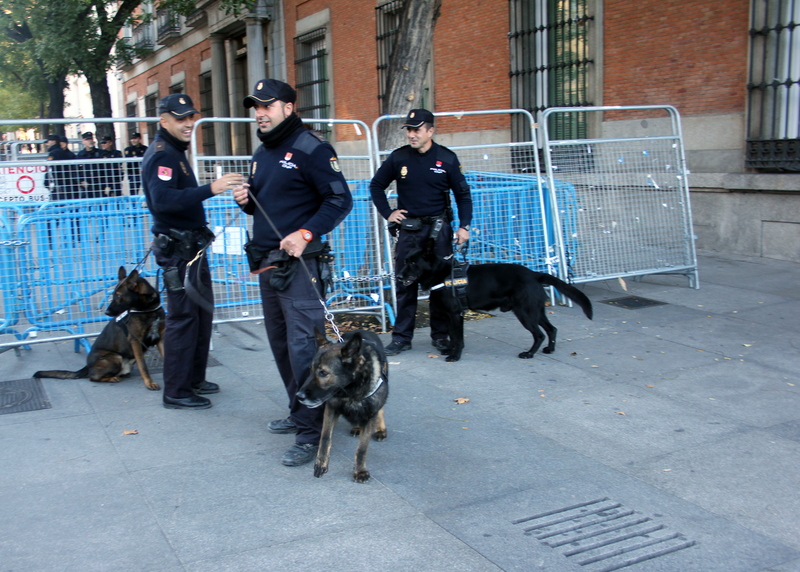 Madrid Police wear their uniforms well. They wear their uniforms well. They’re athletic. They carry guns on their thighs. Their hats give them a simultaneous air of authority and mystery. A Madrid policeman can come to my rescue any day. 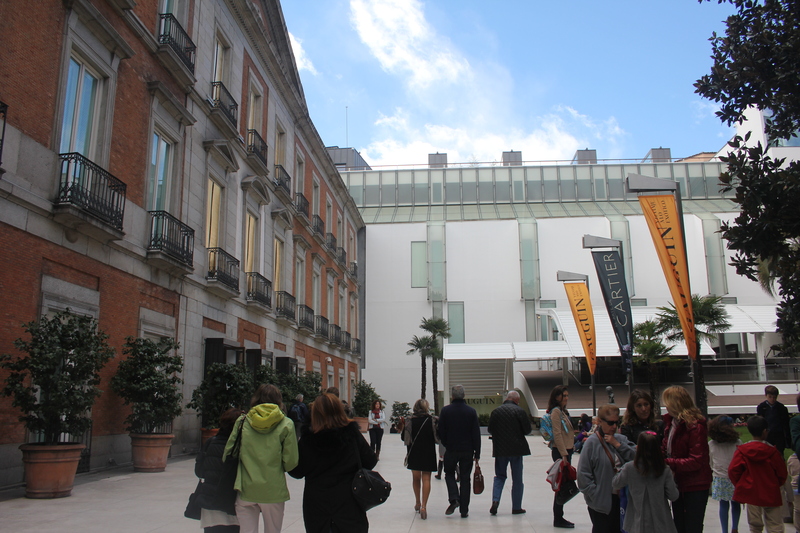 We only had a short stay in Madrid and our plan was to go to the Museo Thyssen-Bornemaisza, my favorite museum in Europe, and then go for tapas at a restaurant around the corner that, 4 years ago, had the best fried anchovies. A little protest wasn’t going to get in our way. Walking the block to the museum gave us a better idea of what the city officials were expecting: something serious. A month earlier, a similar protest had turned violent and rubber bullets had been fired on protesters. Several were injured. Many went into custody. Perhaps the one consolation this time round was that many of the protestors would be police officers on their day off. A herd of police dogs. Mounted police. The ever-growing numbers of armed officers. Flashing blue lights. It was hard not to be a little nervous, especially when staying so close to the center of activity. But when things get tough, the tough order tapas. 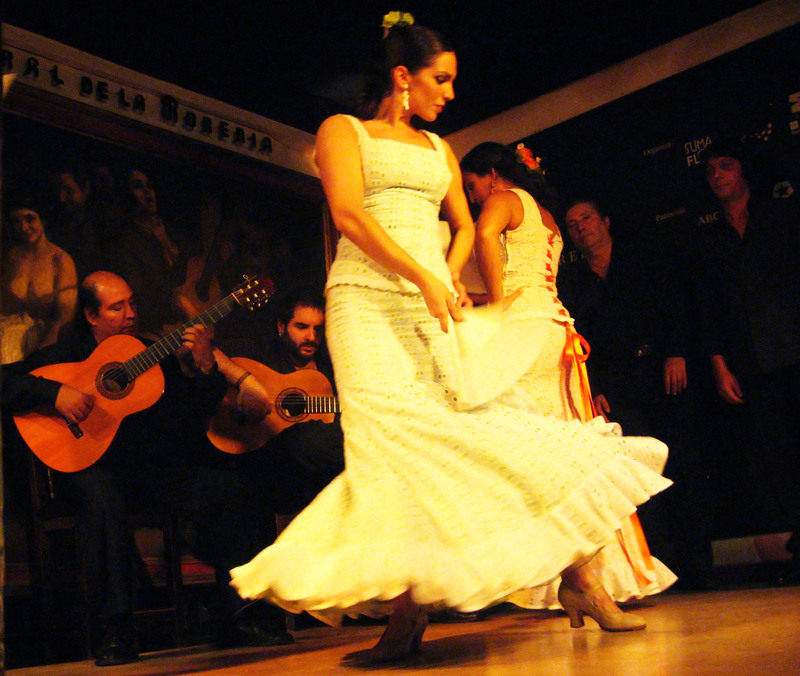 The Estado Puro is a tapas bar on the ground floor of the NH Paseo del Prado. On my last trip to Madrid, this was my daily snack stop. Since then, I’ve made my rounds at other note-worthy tapas bars in Madrid, New York, D.C., and then on this trip, Barcelona, and still concluded that the Estado Puro is as good as it gets. 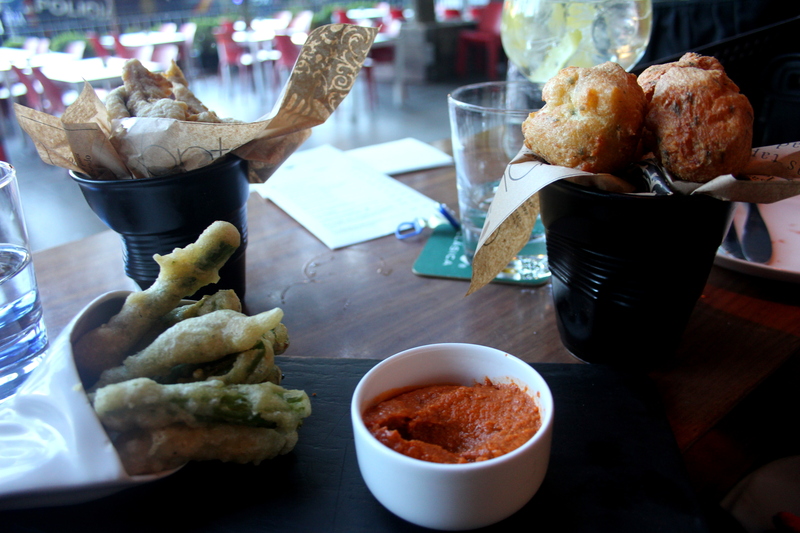 Fried anchovies, cod fritters, and tempura asparagus. Sure it was all battered and cooked in hot oil, but it was delicious and a perfect pre-protest snack. The other great advantage to the Estado Puro is that its long windows guarantee great people watching. 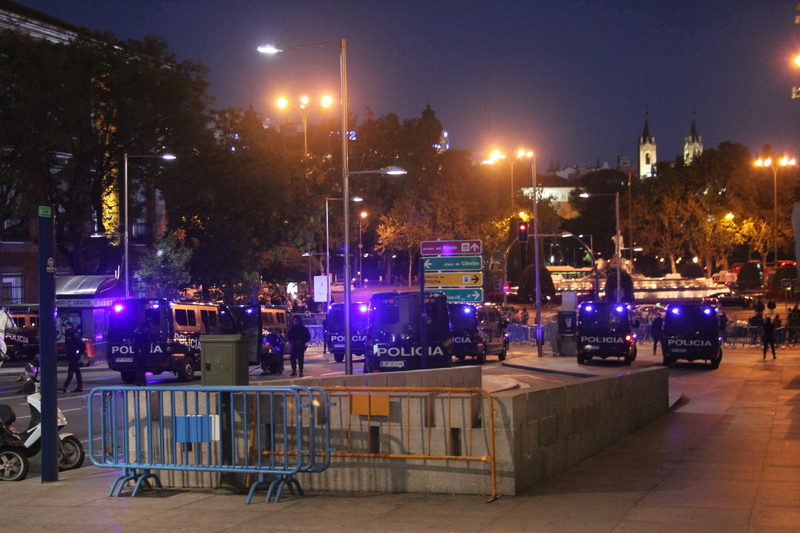 There were hundreds of police milling the streets and yet the residents of Madrid, and even the handful of tourists about, were moving with no sense of concern. Caught between wanting to play the part of amateur photojournalist and fearing rubber bullets (the hotel had said the protest was supposed to be “peaceful” but “could not guarantee” anything… comforting), I lingered on the street corner waiting for things to get interesting. But when a group of protestors began to gather at the edge of the Fuente de Neptuno, I decided it was time to hustle indoors. We flashed our room keycard at a back street barricade and scurried down the street into our hotel, up to the third floor, shut the lights and began to watch as the march began. First, only a handful of people began to lineup along the barricade. A few signs blew in the cold autumn air, but this group looked generally small and nonthreatening. “They brought out all this force for that?” we thought, as the first half hour passed. Thousands poured in, banging drums, playing instruments, carrying banners, chanting. 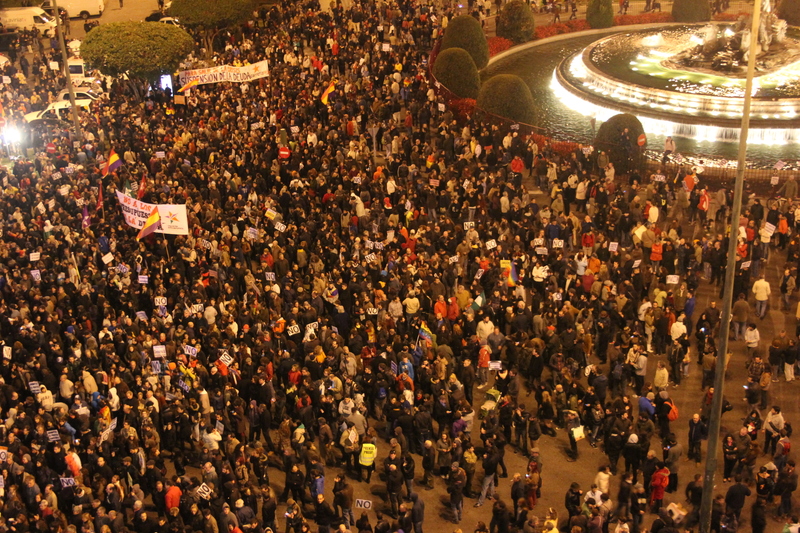 It felt organized and surprisingly joyful, despite the clear anger and frustration in the crowd. Spain’s unemployment rate is 25%. Jobs are disappearing at an alarming rate, and the numbers on welfare do little to help the country stabilize. Meanwhile, Catalan is carrying on a succession campaign. The unrest as understandable as it is widespread. The crowd was a medley of age groups — it wasn’t just restless unemployed college students. They rattled the barricades, chanting in unison and waving their signs. All the while, the police stood at attention. In all of the anger, there was a clear sense of camaraderie, which despite the growing tension was comforting. Would they “storm the barricades?” There was a violinist leading a small chamber group — chamber orchestras don’t storm barricades. Or do they? Police cars began to proceed down the surrounding avenues, closing them off as points of entry for additional protestors. The blue lights pierced the nights. Police directed pedestrians away. Was it about to erupt? No, violinists don’t storm barricades. At least not in Madrid, not this time. After about an hour and a half, the group began to clear. A few small pods gathered in circles to talk. But the excited And then the street cleaners descended. I awoke shortly before the sun rose and looked out on the plaza, which glistened as if it had rained — all traces of the protest, from sidewalk chalk scrawled statements of unrest to the banners that had covered the barricades were all washed away. As the sun began to peak over the buildings to the east, I began to make my way West, homeward-bound for New York.